Why should I like lasers? Lasers are not the same as drills, right? Aren't lasers from the future? What's not to like about lasers? Cats chase them, Jedi carry them, and, in dentistry, they can create a euphoric experience for the patient. Recent Gallup Well-Being research found that more than one-third (35.3%) of Americans had not visited the dentist in the past 12 months. A major reason is that patients fear the dentist. Imagine a virtually painless, blood-less, quiet, no-needles appointment. Dr. Po's Solea laser could remove all those fear factors. Dr. Po's Solea Laser vaporizes water and hydroxyapatite, the mineral that makes up about 90 percent of tooth enamel. The procedure removes decayed portions of damaged teeth and helps prepare the area around cavities for fillings eliminating the unpleasantness of a drill. Correct. Lasers are quiet and fast! 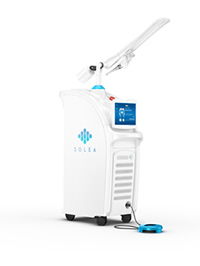 Because it's only a beam of light, the Solea laser enables Dr. Po to achieve precision and accuracy without the vibration of a drill while decreasing the time a patient spends in the chair. As an added bonus, the majority of procedures can be done anesthe-sia-free (98% of patients report feeling no pain during the treatment). In other words, do our patients pay more for services that use the laser? We know that lasers aren't for everyone. That's why our patients can choose the laser technology or utilize traditional cavity treatments. Both methods cost the same. Actually, lasers were first introduced to dentistry in the early 1990's. But for many of our patients, the laser has become the experience they prefer when they visit us. Lasers may not be from the future, but they are the future of dentistry. Learn more about our laser dentistry.